A party three and a half years in the making actually came to fruition yesterday. There's no reason it actually should have taken that long to happen, and there was nothing about it that would have seemed like it took that long to plan, but it did. There's no real reason that I was chosen to man the grill other than the fact that I brought the meat. But with such responsibility comes the opportunity to improvise and get creative. And that's how we get grilled bacon. Generally with my beer brats, I'll use a light, lager beer and a white onion. There's no reason to use an expensive craft beer for this, so go for something cheap. 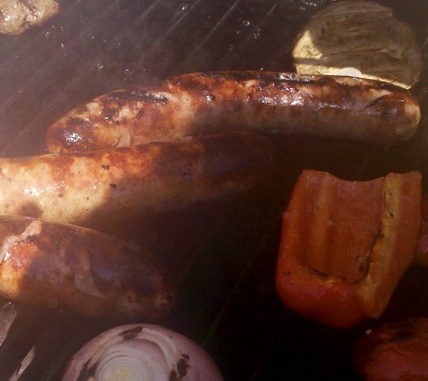 Use enough beer to cover the brats; it's usually a bottle or two for 5 brats. If I'm making 5 brats, I'll use one roughly sliced onion, but adjust the quantity to your tastes. This is a preparations with loose recommendations, not firm instructions. Version one of the beer brats was an experiment during Memorial Day weekend. There are no pics on this one, just a general method. I picked up some chicken brats from Whole Foods while getting the ingredients to assemble a kale and bacon gratin (recipe to come, absolutely delicious). Despite it being Memorial Day weekend, this was not a grilling weekend - this was going to be a grill pan weekend and as such I was hoping to see how close we could get to the real thing. Rather than boiling my brats in the beer and onions, I marinated the brats in the beer and onions for about 7 hours in the refrigerator, then sent them direct to the grill pan for 20 minutes or so until they were fully cooked. This method doesn't result in the same fired taste of a grill, but the beer was a prominent flavor and something I'd try again as a substitute to the boil and grill method. Version two is our grilled method, but done in a way I had not seen before, that I thought was clever. It could just be my lack of experience, but I like putting everything on the grill vs using the stove to precook the brats. Basically, you take a disposable (or grill safe) pan, put your beer, onions, and brats in there, and put the whole pan on one side of the grill. 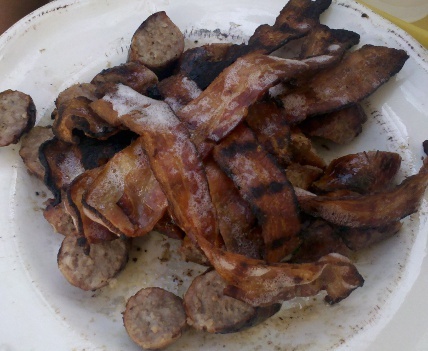 Once your brats have turned white on all sides, you can put them directly on the grill. Grill on both sides so you get nice grill lines and your brats are ready to eat. Earlier in the day at our BBQ, I had made some fresh jalapeno poppers and had some leftovers bacon. We weren't really sure what to do with it, so we threw it on the grill to see what would happen. We started out with it on the upper rack, and the fat melted, but it didn't seem to be turning into crispy bacon like we would have liked, so we moved it down directly over the fire, let it cook for a few minutes, and the results were fantastic. I'd caution you to watch it closely or not let the fire get too high. It only took a few minutes of cooking time and we took them off when we felt like they were ready. That's a matter of preference, as we could have eaten them direct from the top rack if that's how we liked our bacon. We did have one very black, charred casualty, but it was all in the name of science and we did enjoy the rest. This is a good thing to keep in the back of your mind for the next time you're grilling burgers and want to put some bacon on them.